The Maasdam, a 1,258-passenger cruise ship, sits at anchor in Frenchman Bay off Bar Harbor in June, 2010. On Thursday, May 3, the ship is scheduled to make the first of 120 cruise ship visits scheduled for Bar Harbor this year. The Maasdam is expected to drop anchor nearby in Frenchman Bay 17 times between early May and mid-October. A trio of pedestrians walks along Main Street in Bar Harbor on Saturday, April 28, 2012. 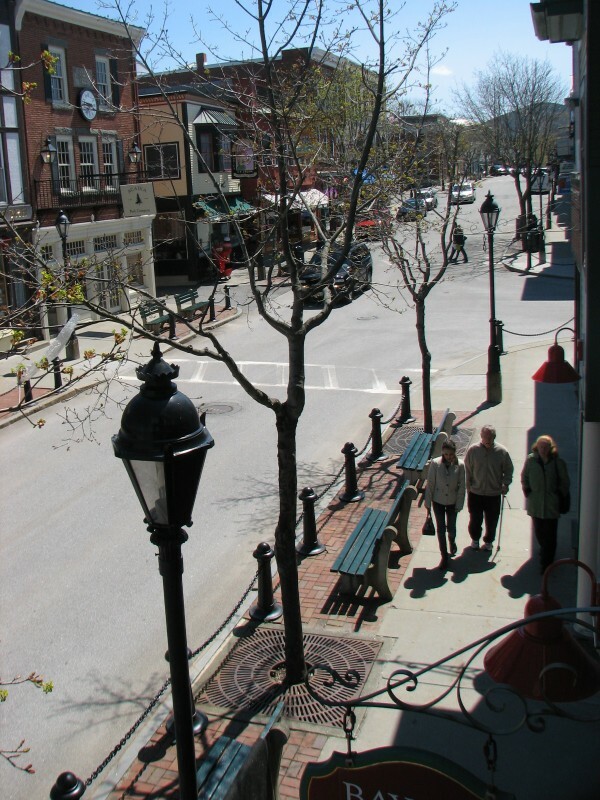 Many of the town's seasonal shops are opening up for the 2012 tourist season and could have more than 1,000 potential new customers in town on Thursday, May 3, when the cruise ship Maasdam makes the first of 120 cruise ship visits scheduled for Bar Harbor this year. BAR HARBOR, Maine — For people who are accustomed to keeping an eye trained on the local waterfront, a familiar sight this week will herald the start of an annual phenomenon in Frenchman Bay. As is usually the case every year, the arrival of cruise ship Maasdam in the waters off Bar Harbor will kick off the town’s cruise ship season. The Maasdam, which can carry more than 1,200 passengers, will make its first visit this year on Thursday, May 3. 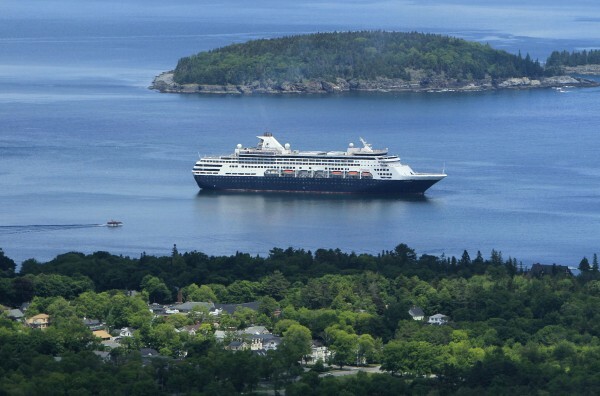 The Holland America ship is scheduled to make a total of 17 visits to Bar Harbor this year. The ship’s May 3 stop will be the first of 120 visits that are scheduled to occur in Bar Harbor between early May and the end of October. With that many scheduled visits, it could be a record year for Bar Harbor, depending on how many cancellations might occur. Cancellations, mostly due to weather, typically happen every cruise ship season, officials have said. According to Charlie Phippen, Bar Harbor’s harbor master, 118 ship visits were scheduled in 2011 and 106 showed up. The year with a record number of cruise ship visits in Bar Harbor was 2010, when it got 107. In Portland, there are 59 cruise ship visits scheduled for this year, three more than the 2011 total. The total number of expected passengers is expected to decrease by more than 16,000 because of a higher percentage of visits by smaller ships, according to city of Portland spokeswoman Nicole Clegg. Clegg said Friday that there are many factors that contribute to year-to-year fluctuations in cruise ship visits. The economy is one, she said, but competition from other ports and cruise ship destinations is another. Clegg said Asian ports and itineraries are becoming more popular, and many ships are heading to the Far East for the summer cruise ship season. And though the second pier at the city’s Ocean Gateway terminal opened last fall, it is not expected to get full use until 2013. Cruise ship itineraries are planned a year or more ahead of time, she said, and the city didn’t start marketing the second pier until after it was completed. Clegg said that as more cruise ship routes come into use, more cruise ships will be built, but it is not a quick process. “It takes a few years for those ships to be completed and come online,” she said. Portland’s cruise ship season is set to begin June 1, when the 98-passenger Independence arrives. The first big ship to visit Portland is expected to be the 3,000 passenger Carnival Glory on June 4, but the next big ship is not scheduled to stop in Portland until early September. In Bar Harbor, 26 of the 120 scheduled visits will be by smaller ships that tie up to the town pier. The Queen Mary 2, a large and well-known ship operated by Cunard Lines, is expected to visit twice, on Sept. 24 and on Oct. 24. The Emerald Princess, which can carry 3,080 passengers and 1,142 crew members, is expected to make its first-ever stop in Bar Harbor on Sept. 29. “I call that one significant,” Phippen said of the Emerald Princess’ inaugural stop in Frenchman Bay. Phippen added that, so far, there are more than 100 large ships scheduled to visit Bar Harbor in 2013. Because Bar Harbor typically gets between 20 and 30 small cruise ship visits, which are not scheduled as far in advance as the big ships, next year could end up being a record year for Bar Harbor, he said. Another change the town is trying to implement is placing marker buoys between Bar and Sheep Porcupine islands so the tenders that carry passengers to and from shore know where to go, according to Phippen. There are shallow spots between the two islands and though there have been no mishaps, the town wants to help ensure that none occur. The harbor master said that at times tender drivers, who work for the cruise ships and aren’t familiar with the bay, try to come around the western side of Bar Island, where a sand bar connects the island to Mount Desert Island at low tide. The town discourages anyone using this route, he said, and hopes the marker buoys on the eastern side of the island will help guide tenders through the more navigable channel. Chad Kessel, store manager for the gift shop Patrick’s By the Sea on lower Main Street in Bar Harbor, said Saturday that the seasonal store has been open since April 7 this year. She said the store has a loyal clientele of local residents but that the increased amount of cruise ships in the spring and fall help boost business. Kessel said the store puts signs in its window, which faces Agamont Park and Frenchman Bay, welcoming cruise ships to town, but it also does the same thing for trade groups that might be holding local conventions. She said that some cruise ship passengers are repeat customers who stop in Bar Harbor every year and make a point of visiting the shop. “I actually send Christmas cards to some of my loyal cruise ship customers,” she said. According to a 2009 economic impact study from the Cruise Lines International Association, Maine’s economy benefited from $34.5 million in direct cruise industry spending in 2009, an increase of about $6 million or 19 percent over the previous year. That spending in 2009 generated 637 jobs in Maine and about $19 million in wages for Maine workers that year, according to the report. Tourism officials in Maine have said that, on average, cruise ship passengers are estimated to spend approximately $100 in each port that they visit. And officials believe they frequently spend more on subsequent visits. In Bar Harbor, the number of cruise ship visits has grown significantly in the past 20 years. In 1990, it had only 22 cruise ship visits.